Since last visiting the region of the Hidden shrine there has been much upheaval in the region. Severe earthquakes and landslides have wrecked the land you once knew. Phantasmal creatures and polymorphisms have appeared and the ruins above have been twisted. Walls have been twisted, malformed, and some have merged with other walls and solid living matter. What will you find you do not know. The knowledge of those who went before you may be useless and outdated. It is clear a greater evil and its powers have taken hold of the regions as you Return To Tamoanchan. 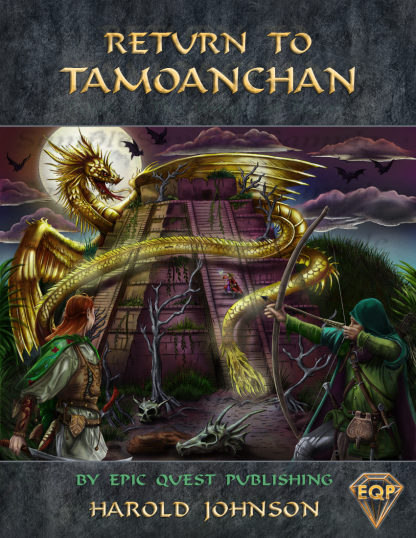 This is the sequel to the infamous ‘Hidden Shrine of Tamoachan’ written by Harold Johnson. Its been more than 40 yrs but now you can revisit Tamoanchan and its the many evils and perils that lie within. This 10th level module is the most challenging ever written by Harold Johnson and contains all the great story telling and mysteries you have come to expect from this legendary author. 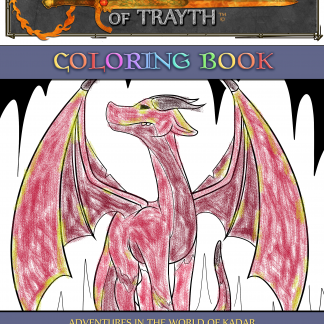 Full color maps, new creatures, DM friendly, and loaded with special features including optional tournament play-ability. If you are classic Dungeons and Dragons player then this is a must have as there is the classic feel to this epic adventure. If you are new to the game then this is where to start experiencing the awe and mystery that role playing games are all about and all using a layout that makes it very easy to play.